Join this self-drive four-day experience in the Warrumbungles. Lodging at the Astronomers’ lodge at Siding Spring Observatory, where you explore the National Park by day and stargaze by night under pristine skies. Join Australian Geographic's on this self-drive five-day experience with Fred Watson. 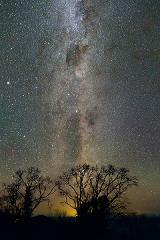 Experience a million-star skyscape in Australia's Warrumbungle Dark Sky Park. Travel Down Under to tour top observatories, including Siding Spring and “The Dish” at Parkes. Go wine-tasting, hike in nature reserves, and explore eclectic Sydney. No visit to Australia is complete without snorkelling in the Great Barrier Reef. Getting away from the highrise and into the natural setting of Palm Cove, this three-day getaway is perfect for the nature-lover. 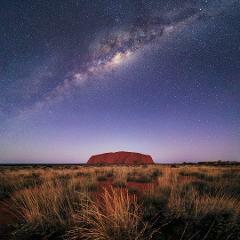 The stars never look brighter than above Ayres Rock at Uluru.